This past weekend, my roommates and I ventured to Switzerland – home of Swiss cheese, Swiss chocolate, Swiss Army knives and of course, the Swiss Alps. My trip was filled with incredible views and adventures. The small town of Interlaken sits far down in a valley between two lakes (Brienz and Thun), with the Swiss Alps surrounding the area. The Youth Hostel we stayed in is bunk bed style like most, the view from our window showed a large mountain with houses placed along the Aare river. The free breakfast was delicious and we were in a decent location, although a little far from the downtown area. A forecast of rain and fog throughout Friday put a damper on our plans, but we still went exploring in our rain coats and umbrellas. The water was like nothing I’ve ever seen before. Minerals from the mountain tops flow down into the lakes and river, creating crystal clear water in a vibrant turquoise color that is safe to drink from. Our guide told us it was the prettiest color she had ever seen due to the weather. After our nature walk, my roommates and I walked into the downtown area to check out the shops and restaurants. We visited the Funky Chocolate shop everyone raves about and I had the best, richest hot chocolate of my life. This quaint shop offers chocolate making lessons, which is pretty cool, but we decided to spend our time drinking it. 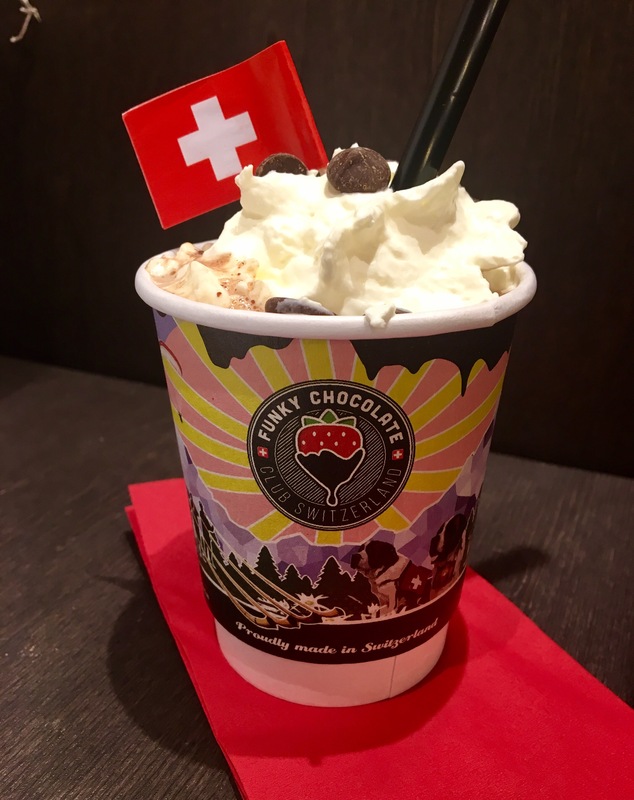 The word “free” was all I needed to see to sign up for the next adventure – a walking tour around Interlaken and the neighboring town. On this walk, the guide gave us some background information on the town and took us to some of his favorite spots. The tour turned into a short hike up one of the mountains, where we visited Alpine ibex (mascot animal of Switzerland), saw some amazing views of the city, and filled our water bottles straight from the glacier water streaming down the mountain. I really enjoyed this tour and have learned that whenever its possible for a local to give advice, a tour, etc., take it. The locals will know the best places to eat, visit, and what to do around town. Every town in Switzerland has their own sign, we were able to explore both of them. There are endless activities to try in Interlaken, whether its skiing, snowboarding, sledding, snowshoeing, hiking, and so on, any activity would be amazing. My activity of choice for the weekend: Paragliding Interlaken. The bus ride up to the takeoff point only took fifteen minutes and a short hike. The guides laid out their parachutes and hooked us in, then with a few quick steps and a running start, the wind took the parachute and we were up in the air. It was absolutely incredible and better than any view from a mountain or plane window. Paragliding is special because flying through the air, above the towns and lakes, and through the mountains gives an overwhelming sense of being free and courageous at the same time. Sebastian was my guides name and he was great, very friendly and funny. During the flight, we skimmed the side of the mountain and came just feet from the tops of the trees. The parachute caught an upwind numerous times, keeping us in the air longer, which allowed for more tricks. Sebastian even let me steer the parachute on the way down doing a move they call “the rollercoaster.” Twirling around in the air, I all of a sudden found myself sideways and we were spinning upside-down and I was loving every moment. The landing was easier than I could have imagined, we basically just started walking in mid air and the ground eventually met our feet. Throughout the fight, Sebastian took pictures and videos of my flight making for a great keepsake. On Sunday we were given an odd amount of time in town before our bus left for Florence. With less than half the day to explore, we had enough time to buy souvenirs and re-hike the trail from yesterday. This time, we walked past the Ibex cage and a couple of us were invited inside. I was able feed them bread pieces and walk around their home. All fourteen of them followed us around the cage, getting a little too close for comfort. This was a neat experience not typically offered to tourists and goes to show that meeting new people while traveling has its benefits. People say when spending full weekends traveling abroad, it’s nice to come back to Florence. I agree with this; however, this weekend was different and I was very much disappointed to be leaving. At my list of top places in the world, Switzerland has made its way to the top and I hope to find time in my future to revisit this beautiful country. Ali, I visited Switzerland way back in 1983 shortly after graduating HS. I left feeling the same way you expressed, and I too hope to get back there some day. So glad you are taking in all that you can. Enjoy reading your journal. I’m glad you’re enjoying it! I don’t know who couldn’t love Switzerland, it’s such a beautiful country.